Can you still get Airfix cars Steve? I’ve not seen any for years. The Mini might be a tad early for the farm, we have only just got electric light and curtains. Quite a few Peter. Mostly re-issues but originals come up in vaious places, such as fleabay. 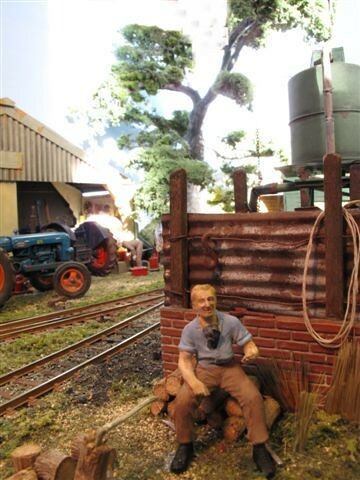 What a treat to see so many photographs of your layout. I keep seeing the odd photo on club exhibition pics and thinking I'd love to see more of it. Thanks so much for posting these, it's a real inspiration. I try to make as much as I can myself. Better to make a b#ll#cks up than nothing at all. Thanks for those kind words Jim. You have made my day. If you want to see it in the flesh I will be at Cheshire Railway Modeller’s exhibition on 22nd January. The venue is Wheelock Methodist Church, Crewe road, Wheelock. Andy Knott my fellow operator and forum member brought his small Canon compact camera with him when we did the show the show at Haynes. 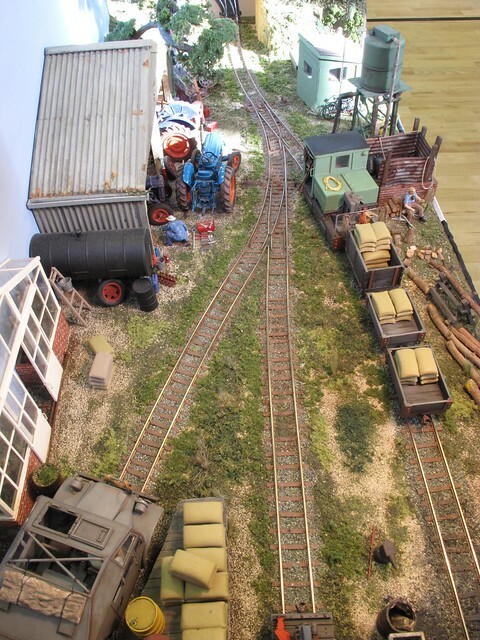 We were the only large scale narrow gauge layout, but there was an oval of track that the 16mm guys were running an assortment of radio controlled live steam. The first picture shows the wood chopper taking a rest with his Labrador puppy in his shirt. The second features a Fordson EIA Power Major warming up before starting the days work. 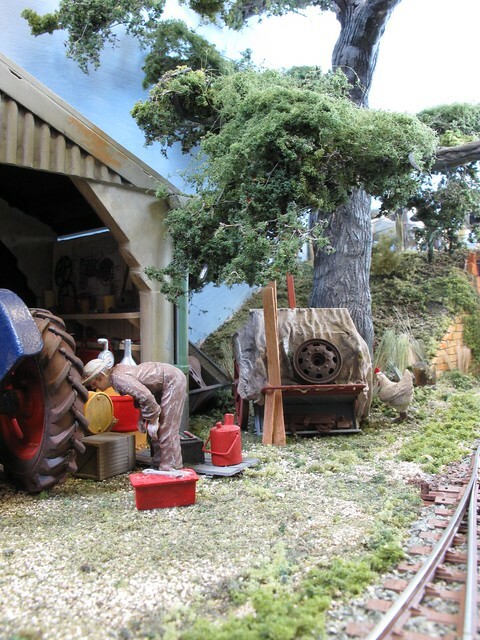 Looking at the overall photos of the layout, how do the tractors get out to the fields? I can't see an obvious route without driving over the rail lines. Through the other end of the work shop, only a very small part of it is modelled. The green house for instance is a quarter of a mile long. The workshop is quite long but not as long as the greenhouse, I'm afraid I just use my imagination. A tractor would have no difficulty crossing two foot gauge railway track of course. Other than the above I’ve no idea. On my walks around the Ashover area I come a few ex Quarrymen and talked to them about the railway. Did the farmers drive their tractors across the tracks, not to mention did they drive them along it as well. Of course not they always denied it, especially when the track was out of alignment and the locos fell off. The farmers would say that the ALR hadn't laid it properly in the first place and had they done so no one would notice that a tractor had been over it. When they did lay a stretch properly the ballast flicked from flying tractor wheels made new weirs in the River Amber. And so on, the Nettle pub at Fallgate is full of such tales. Your remarks about the Ashover Light Railway are interesting Jim. I have the Oakwood Press book in front of me now. Aside from the Baldwin’s didn’t they have some interesting IC locomotives? Back to tractors, I’ve seen the local preservation society driving an ancient JCB back and forth over their track when they had re-laid an extension and were applying the ballast. This of course was standard gauge bullhead track. On this railway there were a few crude accomadation crossings using old sleepers that still exist to this day. In photos of the estate type railways the track always looks sunken into the ground and overgrown with weeds and vegetation. An unusual view taken from the top of a storage barn next to the engine shed looking down the yard towards the fiddle yard end of the layout. 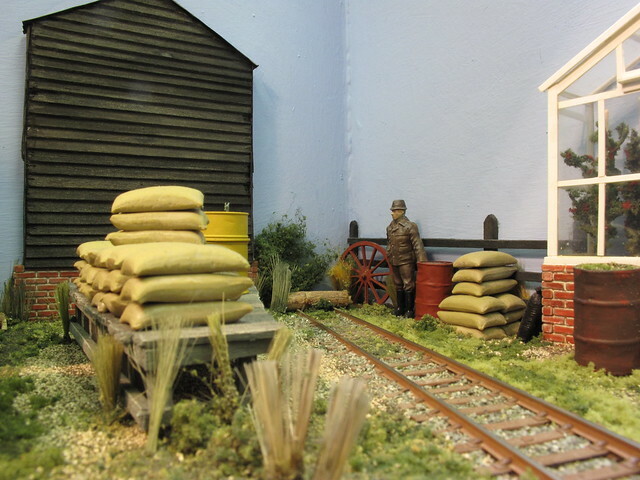 A Simplex type loco is propelling a train of wagons loaded with sacks of wheat into the yard. The quad is parked outside the greenhouse and will depart shortly to the fields to bring back the tractor drivers after their day’s work. Rule 1: It's my railway and I'll model what I want, how I want. Rule 2: In the event of disagreement, see Rule 1. The boss has wandered down to the yard mid morning for a look round. He is a Britain’s hard plastic figure that I’ve removed the base from so he is glued to the base board. Other than a dark grey wash to tone him down a little he is more or less as purchased. The long grass is actually the bristles from a cheap shaving brush tinted with acrylics. While the boss's brother stands daydreaming a man with an apron is picking tomatoes in the green house. He will put them in boxes and then onto a two foot gauge flat wagon and then push them wagon manually the length of the green house. 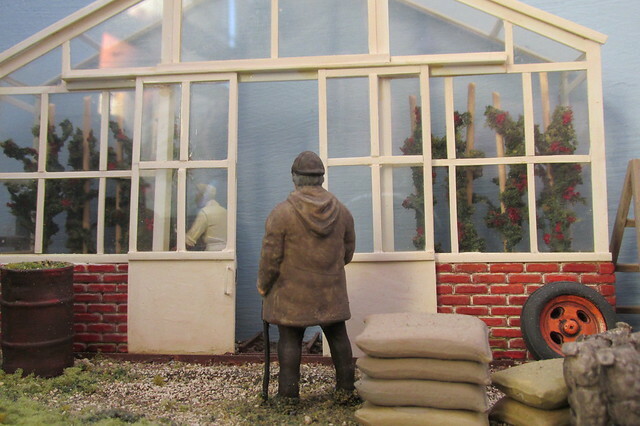 A two foot gauge track ran the length of the green house in the centre. A mechanic in faded brown overalls peers at the rear tyre of a Fordson E27N while a chicken hunts round for scraps behind the horse drawn implement. 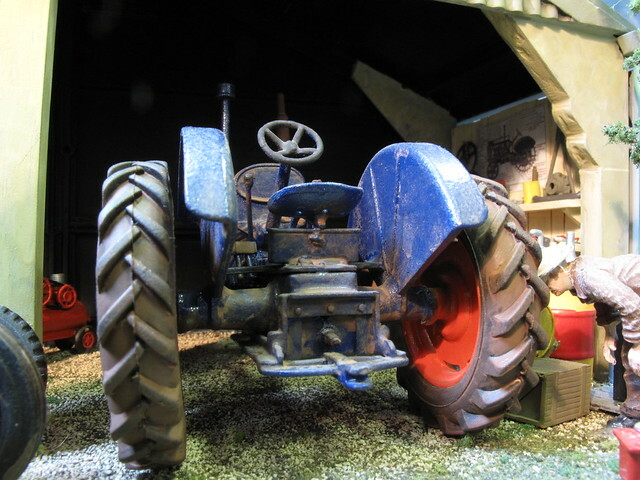 Note the lack of a three point linkage on the tractor, it was trailed ploughs then I guess. I forgot to ask - where do the tractor models come from? Keith the tractors come from several sources. The two older Fordsons the E27n and the Standard N are both Scaledown white metal kits. The newer Fordson Power Major and the MF 35 are both Universal Hobbies models, there are die cast in metal and plastic and ready to go. They tend to need a bit of tlc with regard to small bits not being secured very well, but they are not very expensive. I also have a MF 135 which is a Britain’s die cast model and now a collectors piece. www.farmmodels.co.uk are a source over here. 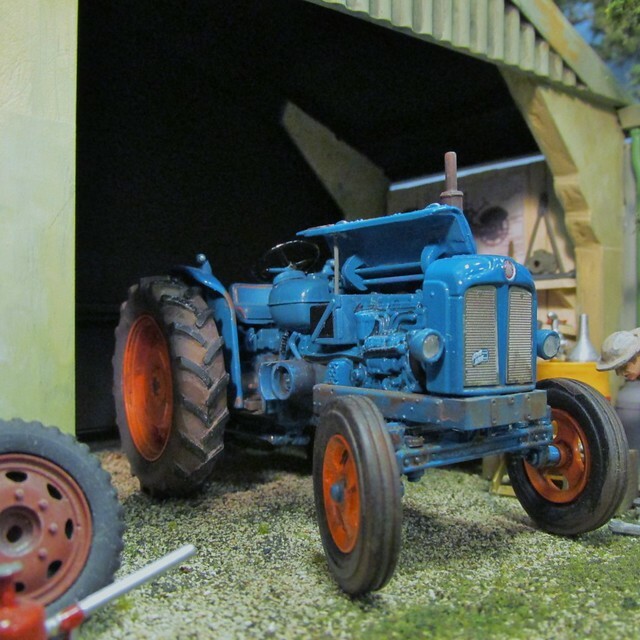 The site is worth a look if you like 1/32 scale farming.